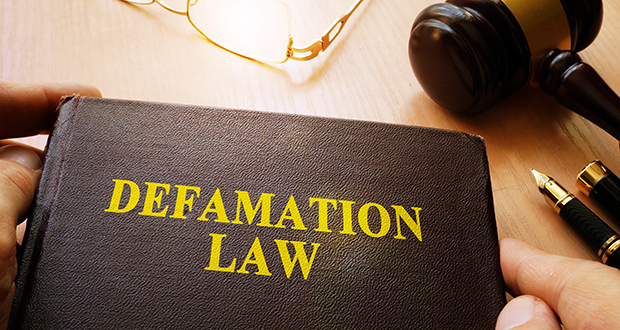 The Minnesota Supreme Court is considering a defendant’s request to make it harder for some defamation plaintiffs to recover damages and a plaintiff’s request to deny a qualified privilege to “non-media” defendants who publish allegedly libelous statements. In oral arguments on Oct. 1, the Supreme Court appeared to struggle with the question of whether an organization that advocates on issues of domestic violence and published allegedly defamatory statements should be protected by a common law qualified privilege because the statements were on a matter of public concern, i.e., domestic violence. It also faced the issue of whether a plaintiff claiming defamation because he was accused of crimes is presumed to be damaged or must prove actual harm to reputation. The organization also faced the argument that it demonstrated no interest in whether the statements at issue were true or not and made no attempt to confirm them, and thus acted with actual malice. A determination of malice could defeat the qualified privilege. Extending the privilege to the defendants would be a big step, the court acknowledged. “We’ve been pretty skinny in granting privileges in the defamation area,” said Chief Justice Lorie Gildea. She asked Margaret Skelton, attorney for Someplace Safe Inc., to name the best argument why the court should extend the privilege to the organization. The privilege is meant to protect speech of value to society, Skelton responded. The case arose when the organization Someplace Safe, in northwestern Minnesota, decided to give its co-defendant, Jacquelyn Jorud, f/k/a Jacquelyn Hanson Maethner, a “Survivor Award.” Jorud had met with the organization on occasions and an advocate once accompanied her to court for a proceeding related to her divorce from the plaintiff, Kurt Maethner. The organization issued a press release about the award and posted about it on Facebook. It also published online an article written by the defendant under the name Jacki Maethner Jorud about surviving domestic violence. An Otter Tail County District Court judge granted summary judgment to the plaintiffs but the Court of Appeals reversed. Judge Diane Bratvold wrote for the court that the allegedly defamatory statements were not protected by a qualified privilege because they were made to raise funds for Someplace Safe and not to protect Jorud or to report a crime; that Someplace Safe owed a duty to exercise reasonable care before publishing Jorud’s statements; and that Maethner produced sufficient evidence of damages to survive summary judgment. Maethner produced evidence of emotional distress, the statements alleged criminal activity, and damages are presumed for statements that are defamatory per se, said the court. The defendants did not file a notice of appeal on the question of whether the publication identified the plaintiff. Defendant Jorud asked the court to extend its 1996 opinion of Richie v. Paramount Pictures and hold that a plaintiff in defamation must always prove damage to reputation as opposed to relying on a theory of defamation per se, which covers cases where crimes are alleged and under which damages may be presumed, including damages for emotional distress. The Court of Appeals distinguished Richie because it said Richie applied only to “media defendants.” Attorney John Bursch of Michigan argued that it should be extended to “non-media” defendants, which opens up other avenues of inquiry, as the chief justice commented. “Media is defined differently than it was even five years ago,” Gildea said. The theory is an anachronism of English common law and does not provide compensation for actual harm, Bursch told the court. Continuing, Burch said his second position is to maintain the media/non-media distinction but treat Jorud as media, as the Richie court did. In Richie, an attorney mistakenly provided a photograph to a news station that identified the wrong people as child abusers. The plaintiff was required to prove reputational harm. But Someplace Safe apparently did not embrace the designation as “media.” Skelton said that the employees are advocates, not journalists and that the focus should be on the content of the speech, i.e., a matter of public concern. The dominant theme of the speech is important precisely because the distinction between media and non-media is no longer tenable, Skelton continued. The qualified privilege is limited to special circumstances, Skelton said, and this is one of them. The Supreme Court said in Bol v. Cole in 1997 that a statement may be protected by the privilege if it is made in good faith, upon a proper occasion, from a proper motive and based upon reasonable or probable cause, she pointed out. Bol demonstrates that the privilege must be based on the unique facts of each case, while the Bol elements and the absence of actual malice in the communications establish that the statements were made at a proper occasion, Skelton said. Someplace Safe had a four-year relationship with Jorud and had no reason to believe anything she said was false, Skelton also said. This case is not about whether a topic is a matter of public concern, said the plaintiff’s attorney, Marshall Tanick. The case is about whether false accusations are made the plaintiff, he said. Tanick did maintain the distinction between “traditional media” cases and other types of defamation and pointed out that the defendants admitted that they are not “media” and the award and newsletter were fundraising efforts. “[T]he trial court … concocted the privilege due to its view of a ‘strong public interest’ in raising awareness of domestic abuse and stamping it out, which the appellate court thoughtfully reversed. “The ‘public interest’ in calling attention to domestic abuse and preventing its occurrence, does not give individuals or organizations license to libel,” Tanick wrote in his brief. Tanick stressed that Someplace Safe did no investigation and made no effort to find out if Jorud’s allegations of domestic abuse were true. In fact, the organization made a deliberate decision not to seek the truth, he said, citing deposition testimony where an employee said they didn’t look into the allegations that were made. “They’re claiming to be clothed in the protections afforded to the media but not subject to the obligations of the media,” Tanick said. To say that there is privilege for allegations of abuse but no resource for the accused deprives a person in Maether’s position of any remedy, Tanick said. It would also encourage false reporting because there would be no “filter” or restraints on what is said. The Richie rule on damages does not apply because that was a negligence case where there was no showing that the defendants knowingly published false information. In this case, presumed damages are appropriate because Someplace Safe, by failing to investigate any of the information, showed actual malice or reckless disregard for the truth. “You don’t have to overrule Richie. They asked you to extend Richie,” Tanick pointed out. The district judge had granted summary judgment to the defendants.